Dhaka, 6 Feb, Abnews: Prime Minister Sheikh Hasina yesterday renewed her call to Myanmar to resolve the Rohingya crisis implementing the Kofi Annan Commission Report, simultaneously seeking intensified global pressures on NayPyiDaw as she held bilateral talks with visiting Swiss President Alain Berset. "We have discussed the Rohingya crisis during bilateral talks with Swiss President Alain Berset," she said in a statement after the talks at the premier's office. Sheikh Hasina, it said, told the Swiss president that since the root of the problem lied in Myanmar, the solution has to be found there but it must come through full and immediate implementation of the recommendations of Kofi Annan Commission Report. The premier said the implementation of the report was "critically important" for sustainable return of the Rohingyas with safety and dignity to their homes in Myanmar. Sheikh Hasina said Bangladesh deeply appreciated the Swiss role over the Rohingya crisis at different United Nations forums and beyond and I'm confident Switzerland, along with the international community, would continue to keep pressure on Myanmar for early peaceful resolution to the crisis". The Swiss president, in his statement, underscored the need for sustainable solution the Rohinga crisis and announced to provide 12 million Francs, equivalent to US$12 million to mitigate Rohingyas plight. "In addition to eight million dollars that Switzerland pledged in October last for emergency humanitarian aids for the Rohingyas, I'm very pleased to announce that Switzerland will give 12 million Francs for the assistance of the Rohingyas," Berset said. The Swiss president also commended the government and the people of Bangladesh for the solidarity, assistance and protection for the forcibly evicted Myanmar nationals. Berset also appreciated Bangladesh-Myanmar agreement on Rohingya repatriation calling it a "positive a step" towards a solution to the problem. 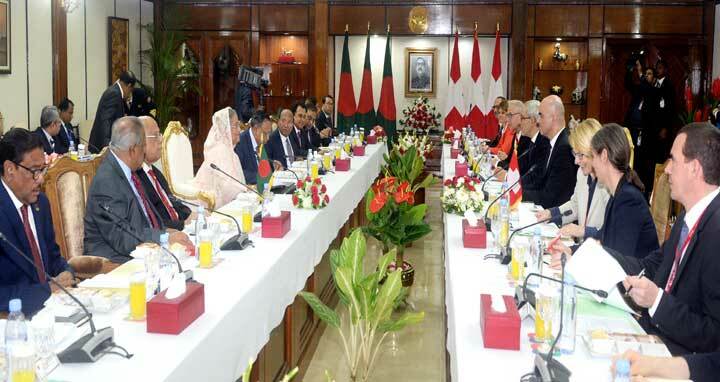 The Bangladesh premier said during the talks Dhaka reached an understanding with Switzerland that there were huge to deepen bilateral cooperation in trade and investment. "I'm very happy to learn that high-powered business delegations from both countries exchanged views in the first-ever high-level Bangladesh-Swiss Business and Investment Forum held today, with the gracious presence of His Excellency President Alain Berset," she said. Sheikh Hasina said the 2030 Agenda for Sustainable Development came up in their discussion "which provides us a unique opportunity to build new global partnerships". "I am happy to note that today both countries have agreed to conclude a framework MoU on collaboration on matters related to the implementation of Agenda 2030 in the near future," she said. The premier said several Swiss multinationals like Novartis, Nestle, and Lafarge-Holcim were in business operations in Bangladesh and expected more such companies of the country to explore opportunities here. "We invite them to participate in sectors like oil and gas exploration, power and energy including renewable energy, critical infrastructure development, ICT, banking and insurance, and pharmaceuticals," she said. The premier noted with appreciation that the two countries issued today a Joint Declaration identifying key areas for expanded bilateral cooperation. "We may now ask our respective authorities to develop a roadmap for implementation of our joint undertakings in a time-bound manner for the shared prosperity of our two people," she said. The premier thanked Berset for making his historic first-ever official visit to Bangladesh saying "this is, indeed, a milestone in our 45 years of diplomatic relations". The prime minister fondly recalled her Switzerland visit in December 2000 at the invitation of the then Swiss President and now "I greatly admire His Excellency's willingness for broadening of our mutual understanding leading to stronger bilateral relations". Sheikh Hasina also remembered that Father of the Nation Bangabandhu Sheikh Mujibur Rahman had great admiration about Switzerland for its democratic values, high economic achievement, and unique foreign policy of peace, friendship and firm neutrality. "Bangabandhu, my father, looked at Switzerland as a model and wanted to develop Bangladesh as the 'Switzerland of the East'," she said. The prime minister recalled that Switzerland was among the first few West European countries to recognize Bangladesh as an independent nation on 13 March 1972. "Ever since Switzerland became an important development partner and a time tested friend," she said. The Swiss President described his country as a "strong and committed" development partner of Bangladesh and expressed his keenness to strengthen further the bilateral cooperation. He said the bilateral relations between the two countries were good and there were strong potentials to develop ties in the areas of trade, culture and climate change. Berset said Switzerland is very much interested to work with Bangladesh in the fields of economic development, governance and safe migration and "my visit is a contribution to promoting relations between the two countries". "With my visit to Bangladesh, Switzerland demonstrates its support and solidarity to Bangladesh . . . also this time of Rohingya crisis," he said. The Swiss president appreciated Bangladesh's efforts for strengthening democracy and rule of law as well as its impressive growth and success in poverty reduction and said "Bangladesh is approaching towards a middle income country due to these achievements". Berset said Switzerland is also lauding Bangladesh's strides for improving business climate and legal security and referred to the strong bilateral cooperation particularly in multilateral institutions including the UN and SDGs. While talking about the trade relations between the two countries, the Swiss president said bilateral trade almost doubled over the last seven years and expressed his firm belief that this bilateral trade and investment would reach a new height in future. The Swiss president also pointed out the long history of friendship between the two countries and said he is looking forward to continuing partnership based on mutual trust and shared vision. Meanwhile, Foreign Secretary M Shahidul Haque along with Prime Minister's Press Secretary Ihsanul Karim at a press briefing at the PMO said Switzerland expressed its willingness to make political level relation with Bangladesh stronger. "Switzerland played a very strong role in the Rohingya issue both politically at the UN as well as in bilaterally," he said. Haque said Berset also expressed his keenness to boost up trade and business relation with Bangladesh as it is a growing economy while many Swiss companies want to come to Bangladesh with their products saying a big market has already been created following the rise of the consuming capacity by the growing middle class people. The foreign secretary added that the Swiss President also expressed interests to work together with Bangladesh particularly on SDGs, climate change and migration issues. Mentioning that there was a good coalition on migration and climate change between Bangladesh and Switzerland, Berset put emphasis on upholding the coalition and expanding it to some extent over the areas of human mobility, climate change and human development. Haque said the two sides agreed that an agreement would be signed between the two countries on SDGs, and added tha this was the first time any developed country offered to develop a collaborative mechanism with Bangladesh in this regard.